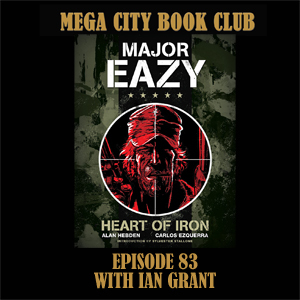 Ian Grant joins me to celebrate a terrific book by the great Carlos Ezquerra and Alan Hebden about their laconic war hero, Major Eazy from Battle comic in the 1970s. Here's hoping for a new Treasury of British Comics edition in the future. Check out Ian's work on The Big Tech show podcast in the British Tech Network. 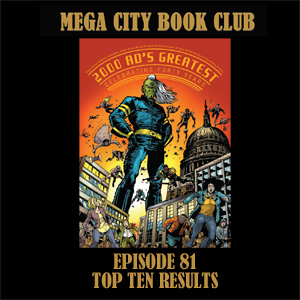 It's the results of the top ten votes as I reveal your favourite Judge Dredd stories and other 2000AD thrills, as well as your favourite series from over 40 years of the galaxy's greatest. Thanks to Alex Frith for the original idea, check out his work at Heroesof2000AD.blogspot.com and a huge thank you to everyone who voted. Check out the 2000AD forum advent calendar and also look for my Chrsitmas charity raffle on my JustGiving page. David Broughton, the creator of Slaughter Hawk, Shamen Kane and many more comics, joins me for a chat about a bonkers, brilliant space opera by Robbie Morrison and Henry Flint. Check out David's comics at his Comicsy store, and follow him on Twitter @DBroughtonDavid. 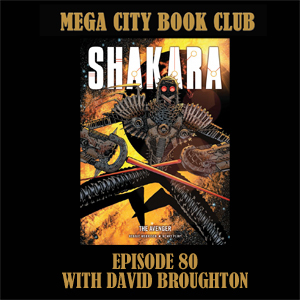 Get your copy of Shakara the Avenger from the 2000AD online store, or from Hachette in the Ultimate Collection. 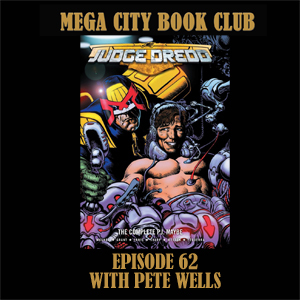 Dave Heeley from the 1977-2000AD Facebook group joined me at the Birmingham ICE convention to discuss a great Dredd epic that nearly saw the end of the character. 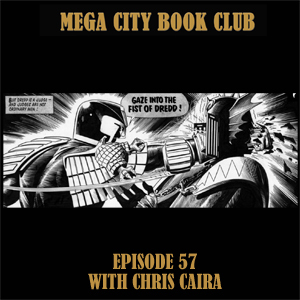 This episode was recorded before the sad news of the passing of Carlos Ezquerra who was one of the true legends of British comics. His beautiful work on Necropolis is just one of the many stunning creations we have to remember him by. 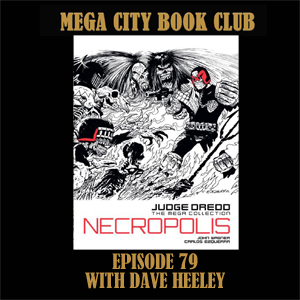 Find Dave's review work on the Word of the Nerd site, and get your copy of Necropolis from the 2000AD online store, or in a Hachette hardback. 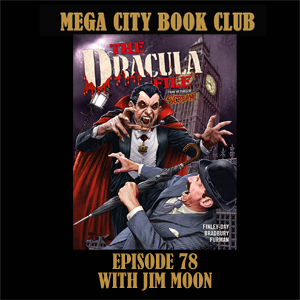 And get your copy of The Dracula File from the 2000AD online store. 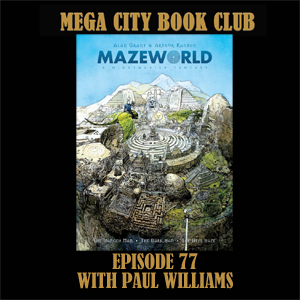 Just in time for the release of a brand new edition I talk all things Mazeworld with one of Tharg's newest art droids Paul Williams, the Sketchy Magpie himself. 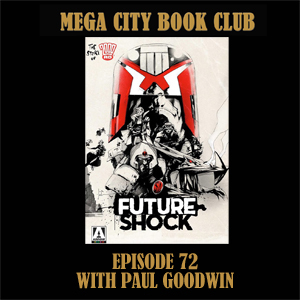 We also discuss the Thought Bubble 2000AD writing and art competitions, and how Paul won in 2017. Get your copy of the brand new collection from the 2000AD store, and if you can go to the Arthur Ranson art exhibition at Orbital comics in London. It's time for the other half of the SpaceSpiner2000 cross-over as Conrad joins me for more rampaging giant animal action. Shako is the only bear on the CIA kill list, find out why. And check out Conrad and Fox every week on SpaceSpinner2000. 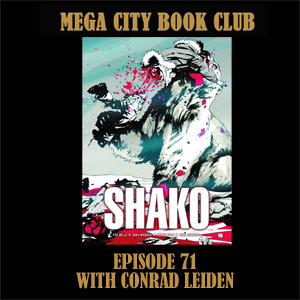 Get your copy of Shako from the 2000AD online store. 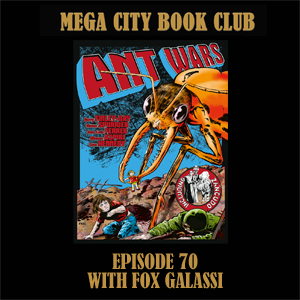 Fox Galassi from the fabulous Space Spinner 2000 podcast is my guest to discuss some old school thrill-power as giant, ravenous ants go on the rampage in Ant Wars by Gerry Finley-Day and a host of great artists. 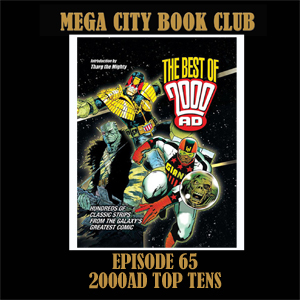 Get your copy from the 2000AD online store and join in the fun. 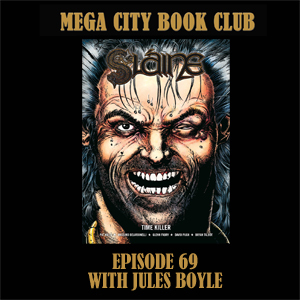 Jules Boyle is my guest to discuss the second volume of Slaine's chronicles, and to tell me how he came to be immortalised in the pages of the prog by Glenn Fabry. 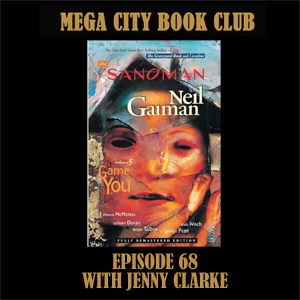 There are some audio issues with this episode for which I apologise, fortunately Jules has plenty of interesting stuff to say about the history of Slaine and his own adventures as a teenage fan of the Galaxys' greatest comic. Check out Jules' own work on his Big Comic Page, and get your copy of Time Killer from the 2000AD online store. 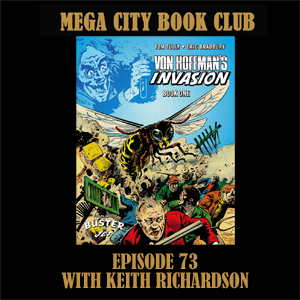 I caught up with Rachael Bullmore on free comic book day to chat about a digest collection of Otto Sump stories and to glory in the wonders of Ron Smith's art. Look out for a Hachette collection hardback which includes all the Sump stories, or check out Case Files 3, 4, 6 and 8 from the 2000AD online store. 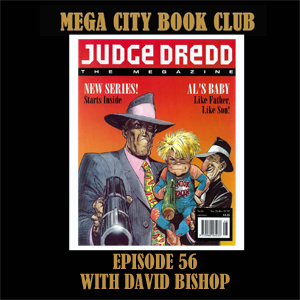 A very short bonus episode to do some housekeeping and to ask you to submit your top ten Judge Dredd stories, and also your top ten non Dredd 2000AD stories to MCBCpodcast@gmail.com so that we can compile our book club list of the best of the best. You are the academy of law and your vote counts! 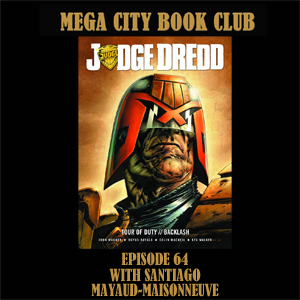 Santiago Mayaud joins me down the line from Buenos Aires to discuss a huge turning point in the history of Judge Dredd, backed up by some great art from the pick of the current artist droids. 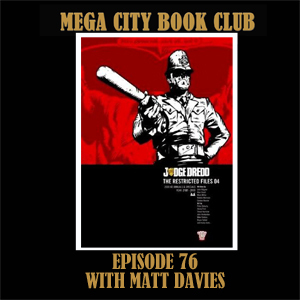 You can find Santi's history of female Judges in Mega-City One here, check out all his work for Zarjaz and Dogbreath, and his new work on Filthy Sleeves Studios. And get your copy of The Backlash from the 2000AD online store. I met up with Julius Howe in a musical London pub to discuss the second volume of the Mek Files and the subject of artwork collecting. The audio quality is not up to my usual standard (apologies) but the discussion is fun. 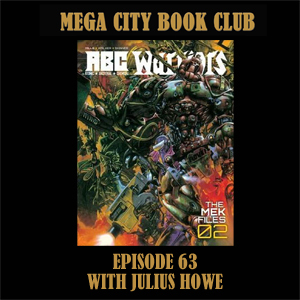 Check out Julius' Inky Fingers podcast about original comic book artwork, and buy your copy of the Mek Files from the 2000AD online store. Pete Wells is back, and he's brought a collection of stories about that constant thorn in Dredd's side, P.J.Maybe. There are spoilers along the way as we admire John Wagner's writing and artwork by a host of Tharg's finest droids. Get your copy at the 2000AD online store, or the Hachette version. And check out Pete's 2000AD covers uncovered blog. 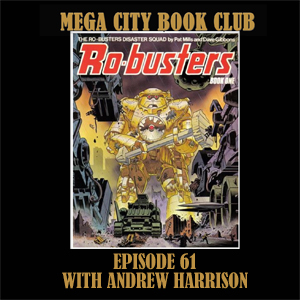 Journalist, editor, and podcaster Andrew Harrison joins me to discuss everybody's favourite story from the Ro-Busters Disaster Squad, written by Pat Mills and beautifully illustrated by Dave Gibbons. As you will hear it's a tale that has particular significance for my guest, including the ending which we do spoil a bit. Check out Andrew's Bigmouth podcast and follow him on twitter @nndroid. And get your copy of Ro-Busters: the complete nuts and bolts vol 2 from the 2000AD online store. 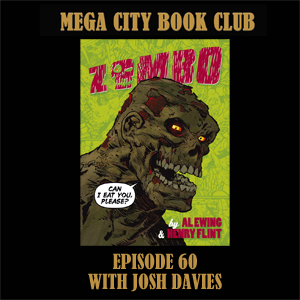 Mr Spongejoshing himself is back in the book club with the masterpiece that is the first volume of Zombo by Mr Henry Flint and Mr Al Ewing. 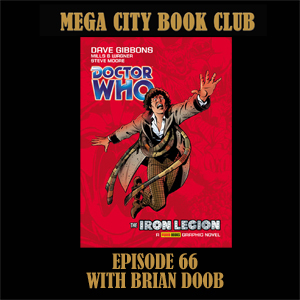 When we manage to control our giggles we discuss the wonders of the big green death machine himself and we manage to avoid spoilers along the way. Check out Josh's blogging at Spongejoshing.blogspot.co.uk and buy your copy of Zombo from the 2000AD online store. 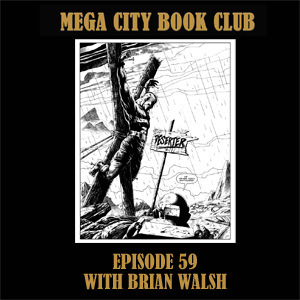 The book club is back in Dublin's fair city as Brian Walsh returns to discuss one of the greatest of Rogue Trooper's adventures, Cinnabar by John Smith, Steve Dillon and Kev Walker. Check out Brian's artwork on our facebook page and at his site. And get your copy of Tales of Nu-Earth 4 from the 2000AD online store. 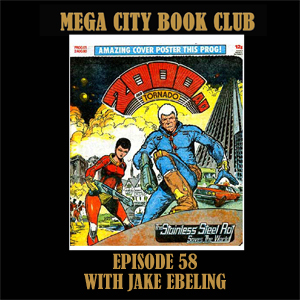 It's time for a science fiction classic as Jake Ebeling joins the book club to discuss Harry Harrison's Stainles Steel Rat as brought to the pages of the prog by Kelvin Gosnell and Carlos Ezquerra. We visit all three of Slippery Jim's 2000AD adventures. 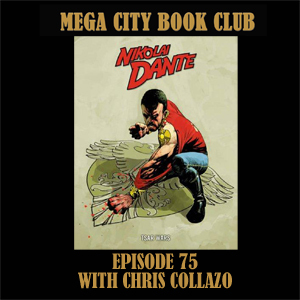 57: Gaze into the fist of Dredd! It's the most famous page in the history of British comics and I spoke to the lucky chap who owns it. 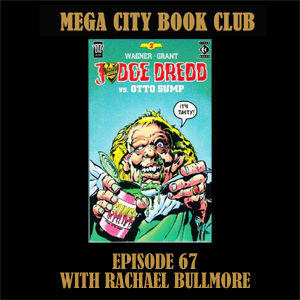 We chat about his collection and how he met Brian Bolland and acquired some key pages from him. You can check out Chris's astonishing collection of pages and commissions on his ComicArtFans page. And of course you can read the Judge Death Lives story in a variety of collections from the 2000AD online store. 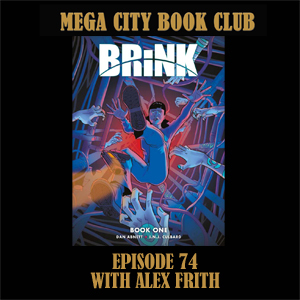 The voice of Tharg returns as David Bishop makes his third visit to the book club to give his insights into the conception of Al's Baby in the Meg, and the subject of creator owned strips. You can find details of his creative writing course at Edinburgh Napier university, and find all David's books on his Amazon author page. Al's Baby is still on the 2000AD online store. 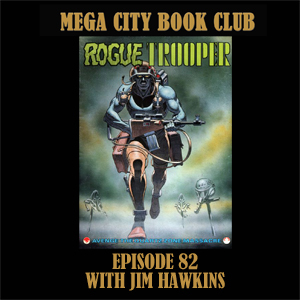 It's the weirdest pregnancy to ever appear in the pages of the Meg and the Prog as Ben Penfold-Marwick joins me from Oz to discuss a comedy classic from our heroes, John Wagner and Carlos Ezquerra. Hurry to the delivery ward on the 2000AD online store to get your bouncing copy of Al's Baby.